We understand that in today’s economy, bringing great leadership to healthcare organizations and higher education institutions is both essential and urgent in order to maintain a competitive edge. We also understand that it poses a challenge because so few candidates are uniquely qualified for these top-level leadership positions. That’s where we come in. From Chief Medical Officers (CMOs) to Chief Executive Officers (CEOs), we have a record of placing physician leaders and top-shelf business executives who understand the changing landscape of healthcare in leading organizations across the country. We develop long-term, mutually rewarding partnerships with academic organizations to ensure recruitment of the best and brightest talent. To learn more about our executive search services, please contact us. We also provide services for: Physician Search and Advanced Practitioner Search. “We had an aggressive timeline in which to fill the CEO position for Springfield Clinic. 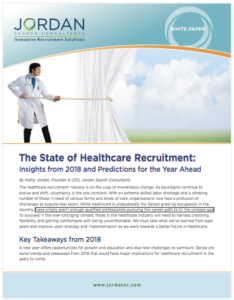 Although Jordan Search Consultants (JSC) was referred to us by a well-respected healthcare provider in the area, we did our due diligence by evaluating the top national healthcare recruitment firms. Jordan Search Consultants impressed Springfield’s executive leadership team during the interview; it was clear they understood executive recruitment, healthcare, and our community.